Publisher: Ananda Publishers Pvt, Calcutta, India. Contributed by Robin Sommeling, Yann Vincent, Hans Selles, and Christian Koehn. 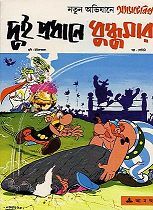 Transcribing (letter-by-letter) the name of our hero yields something like "Ayshteriksh", however, Anandashankar Mazumdar remarks that its pronounciation is close to English "Asterix".